Searching for creative Mr and Mrs Gifts? You’ll want to check out this selection of wonderful hand-selected presents. Mr. and Mrs. Gifts are perfect for wedding showers, anniversary, Valentine’s Day, Christmas, or any special occasion that calls for a unique present. 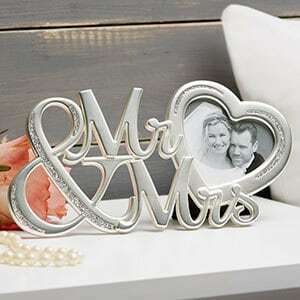 Each of our gifts have the Mr and Mrs title on them – and many of these delightful presents can be personalized with the couple’s surname or first name. If you’re looking for a last-minute gift, many of these gifts – even the personalized ones – can ship out in just a day or two. Just click on any item to find out the exact shipping time. She’s found Mr. Right – and, although he might not know it yet, he’s found Mrs. Always Right! 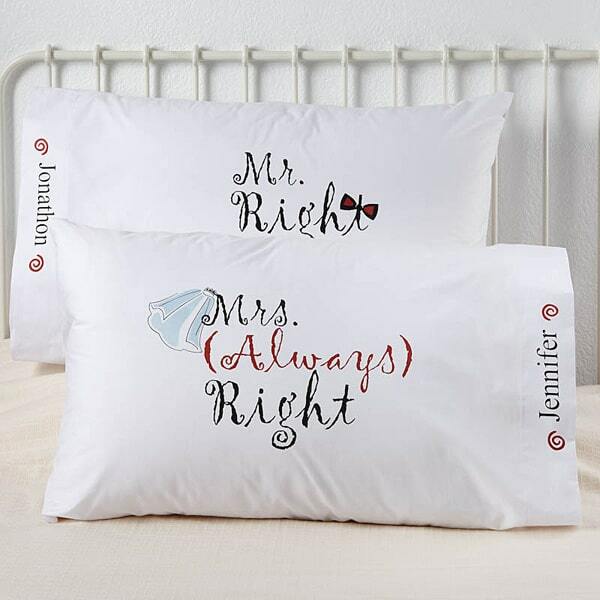 These delightful personalized pillowcases make a fun, unique, and practical gift that’s sure to bring a smile to the bride and groom’s faces. The Mr. pillowcase features a bow tie graphic, while an adorable veil is highlighted on Mrs. 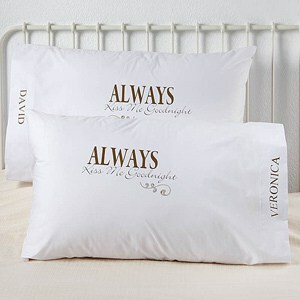 Always Right’s pillowcase. 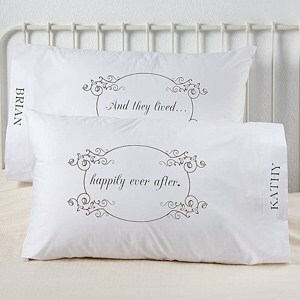 Personalize this fun Mr. and Mrs. gift by adding the bride and groom’s names to the side of each pillow. If you’ve left your shopping until the last minute, don’t worry – these pillowcases can arrive within 2 days of ordering. With so many lovely wedding pictures, it’ll be hard for the couple to choose the perfect one. Choosing the perfect frame won’t be a problem though – this lovely frame has over 1350 glowing reviews! 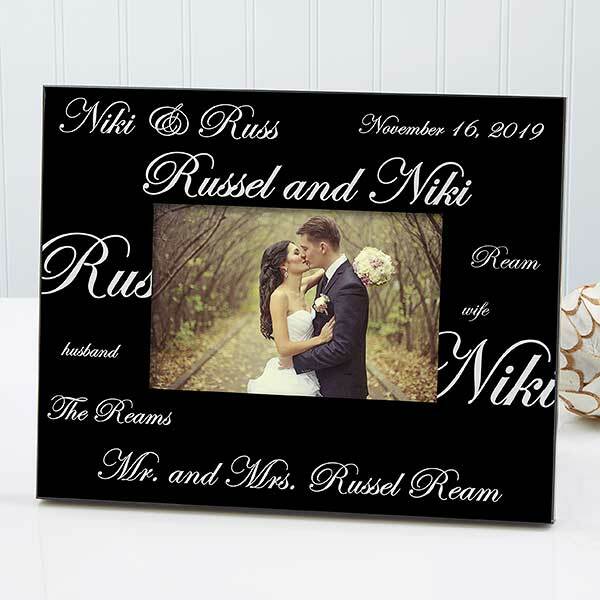 You’ll be proud to give the wedding couple this one-of-a-kind Mr. and Mrs. frame that’s personalized with their wedding date, formal names, nicknames, and last name (both singular and plural). This stunning 8 x 10″ frame is perfect for the couple’s favorite 4 x 6″ photo. It’s available in either black or white background with reverse colored lettering, so it’s bound to complement any decor. Looking for a last minute Mr and Mrs gift? This frame can be shipping in just 2 days, so no one will ever know you waited! 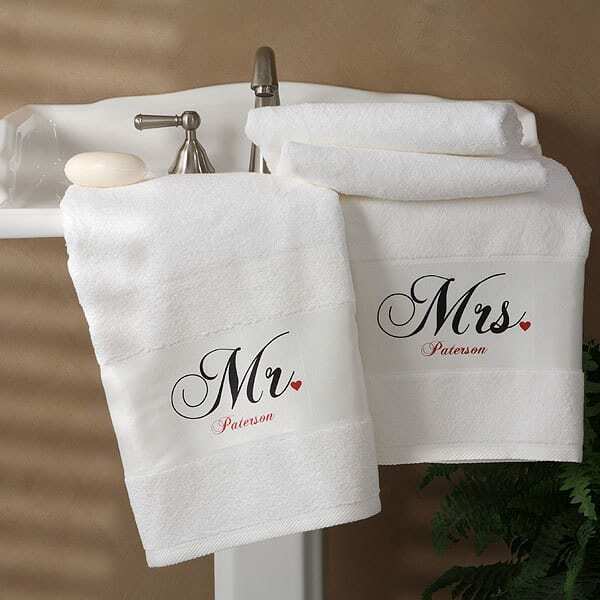 The loving couple won’t argue over towels when you give them this adorable personalized Mr. and Mrs. bath towel set! 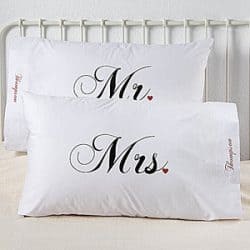 These generously-sized, plush terry-cloth towels feature the “Mr.” and “Mrs.” title in elegant black script with their married name underneath in red letters. Even the punctuation is special – the periods after Mr and Mrs are heart-shaped. These 100% cotton towels are ideal for wedding gifts, Valentine’s Day gifts, or any special occasion, but they make an especially appropriate gift for the 2nd wedding anniversary, which is cotton. 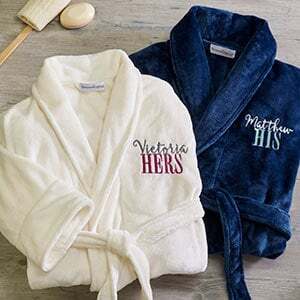 What’s a better gift for a couple that needs to relax and unwind than a pair of matching Mr. and Mrs. Bathrobes? Well, perhaps a two-week spa vacation, but that might be a bit pricey! 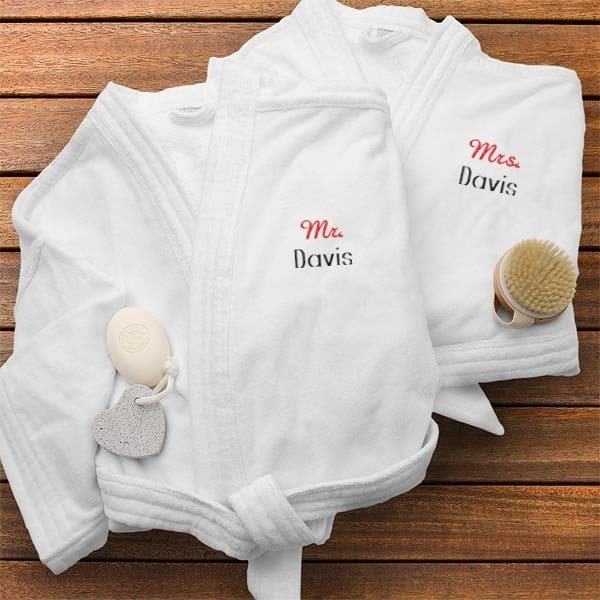 Perfect for honeymoon, a spa vacation, or just lounging around these house, these plush white hotel-quality velour robes are sure to be a hit at a wedding shower or any gift-giving occasion. Luxurious 100% cotton robes each have 2 pockets for carrying essentials such as hotel keys, kleenex and money. The appropriate Mr. or Mrs. title is embroidered in an elegant red script, with the couple’s last name underneath in black block letters. 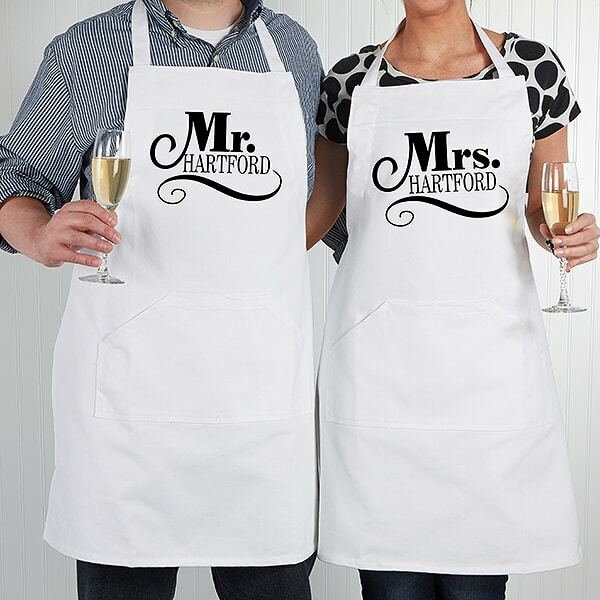 There’s a whole lot of love cooking up in these delightful Mr. and Mrs. gifts for the kitchen! 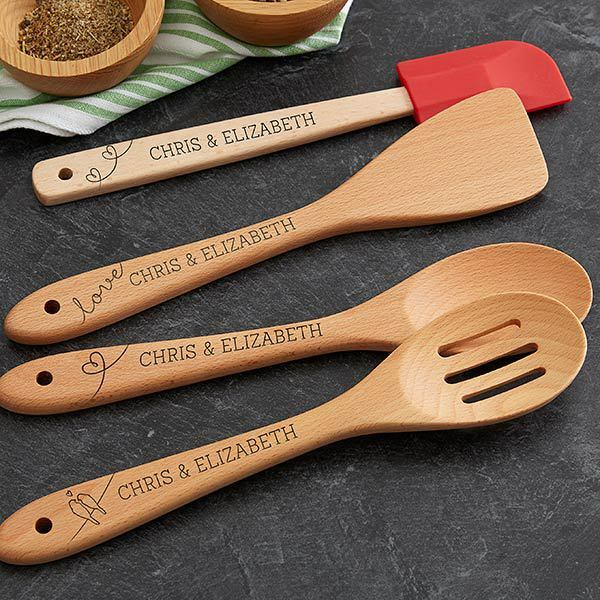 This personalized 4 piece beechwood cooking utensils set is perfect for the loving couple to prepare their favorite recipe. The set includes a 12″ Corner Spoon, 12″ Slotted Spoon and 12″ Wood Spatula and 12″ Red, Plastic Spatula. Each has a cute design engraved on the end, as well. The couple that cooks together, stays together – or at least eats a delightful meal! This adorable apron set is bound to bring chuckles to anyone who sees it. These cute aprons each include a personalized name and a fun little swirl. They’re both adorable and chic. These unique aprons make a wonderful wedding shower gift, housewarming gift, or anniversary gift for couples both young and old. After the honeymoon is over, real life sets in. Add a little romance to even the couple’s workday mornings with a set of matching Mr. and Mrs. coffee mugs. These unique black and white personalized mugs feature a unique heart shaped handle and a stylish arrow decoration. 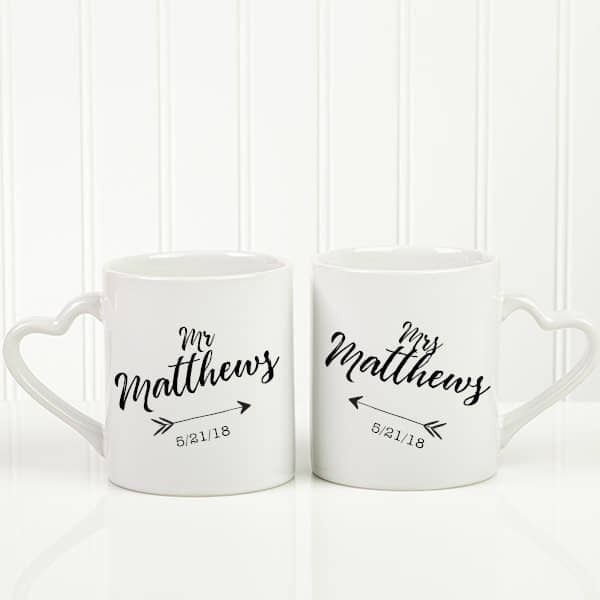 Each 8 ounce mug is personalized with the couple’s last name and their wedding date. These make a wonderful stand-alone gift, or you can pair them with gourmet coffees or a new coffee maker if you want to splurge a bit. 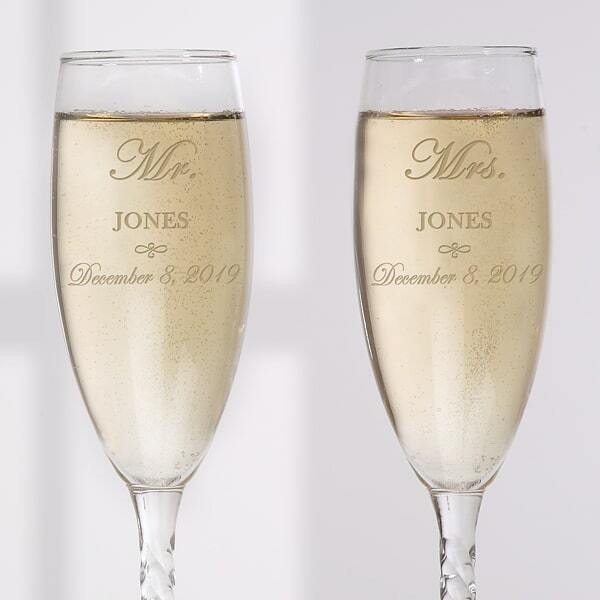 These personalized Mr. and Mrs. champagne flutes are so exquisite that the couple will make up excuses to serve champagne just so that they have a chance to use these! These exquisite champagne glasses feature an elegant stainless steel base with an elegant twist. 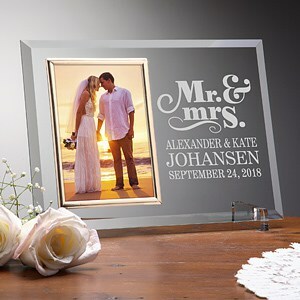 Each are personalized with an engraving of the couple’s names and their wedding date. Each glass is engraved with Mr. and Mrs. in an elegant script at the top; underneath is the couple’s surname in a block font. You can add the couple’s wedding date for a special touch. 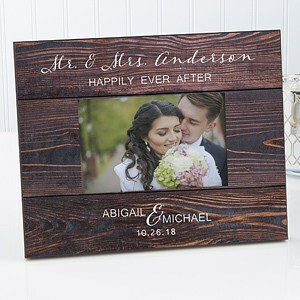 If you’re looking for unique Mr. and Mrs. gifts – the kind that will make the couple cry out, “How did you ever think of this?” – you’ll find them here. This personalized Mr and Mrs wind chime is one of those totally unexpected gifts that is sure to please almost anyone. 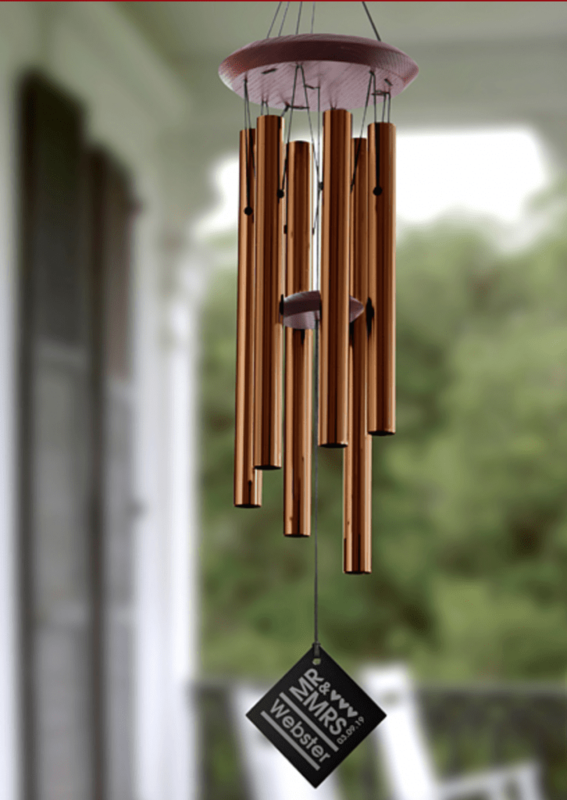 The skillfully crafted bronze chimes are hand-tuned to produce an amazing sound whenever a gentle breeze arises. The wooden wind-catcher charm is engraved with the Mr. and Mrs. titles, the couple’s last name, and their wedding date. Send your favorite couple off in style with these easy-to-spot, humorous luggage tags. What better time than a honeymoon for the groom to find out that his bride will always, always pack more stuff than he does. So the Mrs. is obviously going to need more suitcases, and therefore more luggage tags than her husband. This unique luggage tag set offers 3 tags – 1 for the Mr, and 2 for the Mrs. Practical, yet sure to bring a chuckle when the couple opens this gift. The first Christmas together is an exciting time for any couple. It’s the time for them to combine their traditions and start creating their own unique family traditions. This personalized Mr. and Mrs. Christmas ornament is a wonderful reminder of the excitement of their first Christmas as a married couple. 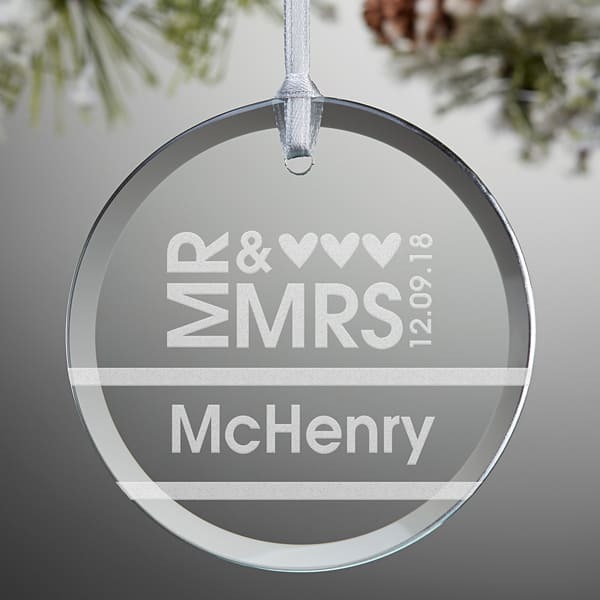 The 3″ round glass ornament is personalized with their surname and their wedding date. It comes ready for hanging on a shimmering silver ribbon. Maybe one of their traditions will be to hang this sentimental ornament first each and every year!